Because this festival has had a lot visitors in the past 5 years and it’s grown larger each year, I thought the festival would be relevant enough, and earned his own Wikipedia page. Apparently I thought wrong because immediately after I publicized the new page there appeared a tag above the article which said the page asks for changes and feedback because it was placed on the deleting list and by adjusting the article there was a chance the nomination for deleting it would be withdrawn. I discovered how to communicate with the wiki-robot which checks al the new pages and keeps an eye on all the work (publications and edits) users contributes. What strucks me was how other users interfered themselves in my conversation with the wiki-bot. Apperentely being on the deleting list is a public issue concerning every Wikipedia consumer or producer (or maybe I have to define these as the same person as this is mixed up and both can be the same person in one time). The main argument for deleting the page was suspection about my involvement as creator of the page in the Source Company. I responded by placing my denial on this at the ‘talk- page’ of the wiki-robot. Immediately there was a change in the text on the deleting list, namely: ‘user explained to have no connection with the Source Company’. And after this an other (human) user placed comment by sharing his thought ‘this doesn’t sound convincing’. The users with that reffered to my history on Wikipedia and said this made me suspicious. I didn’t know what he meant with this so I checked my history, and there it was. I had (two days before writing the page about Source Festival) adjust some comment on the Wikipedia page of the student association where I was a member for the last years, and which played a crucial role in the history of Source Festival because the inventors have met each other here and came to the idea of designing the festival. By changing te content of this page I had shown my involvement with this student association, in which other users apparently concluded I was also involved in the organization. On this point I experienced it’s hard to prove the opposite and while I was placing my reaction beneath the user comment I felt being enclosed in an never ending discussion with had less to do with the content or relevance of my page, and more with a kind of battle between me and the other critical user. This way of critism is what also is being pointed out in the introduction of the Critical Point of View A Wikipedia Reader (2011) and which seems to fit to the situation described above. So although the ideas of the ‘consumer-is-producer’, and ‘everybody-is-responsibly-for-the-content’ there are guidelines and even rules to which anyone needs to seduce. Of course this is not surprising, what does surprise me is the way in which other users can vote for (or against) a page, using any argument they think is valide. Like the user attempting to my page and concluding from my Wikipedia-history I’m involved with this company I describe here. It’s a bit like the reference in my previous blog post about the media and 9/11. Here I say nowadays everybody who ‘s at an aireport is a terrorist in the eyes of the security, till proven innocent. So without any real information about my profile the Wikipedia consumers concluded your not playing by the rules till you find a way to prove you do. Before getting in to this experience my opinion on Wikepedia was more in which I’ve always been told during my study:’never use this website as source or data for your research because the content and information is not accepted as being academic. Or in other words: a content which is created by a majority doesn’t guaranty quality and truth as University’s announce. Now since my publication on the Wiki-site these are no longer my only concerns about Wikipedia. There also seems to lie some danger in the fact that people can make other pages(with perhaps interesting and relevant information) been deleted by placing there personal opinion. The result from this can be the Wikipedia websites misses highly relevant information and by that can not ultimately develop. Of course with highly relevant and interesting information I don’t automatically mean my own ‘Source Festival’, page. This was only an example and experiment from with I now concluded the possible other consequences. 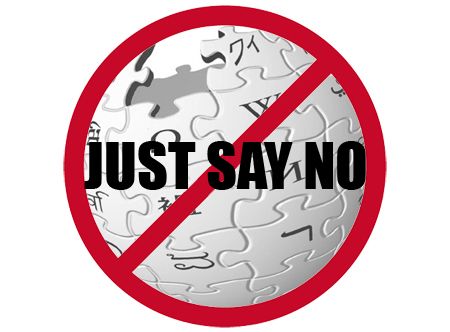 5/10/2011 Read here about the new Italian law which the Italian Wikipedia is firmly against.